I have a big thing about Turquoise - you only need to look at my kitchen, my logo and my summerhouse should proof be needed. But what to eat whilst reclining on my imaginary chaise? With Easter on the horizon my mind turned to eggs and specifically the somewhat retro canape of devilled eggs. As a child my Grandma Corntown often used to take my sister, Mum and myself for lunch on a Friday at The National Hotel in Dingwall. My starter of choice was always egg mayonnaise. It's not something that you tend to see on a menu these days but was a ubiquitous dish of its time. In homage to classic egg mayo I've created a multicoloured dish of Unicorn Devilled Eggs with Smoked Salmon and Caviar. 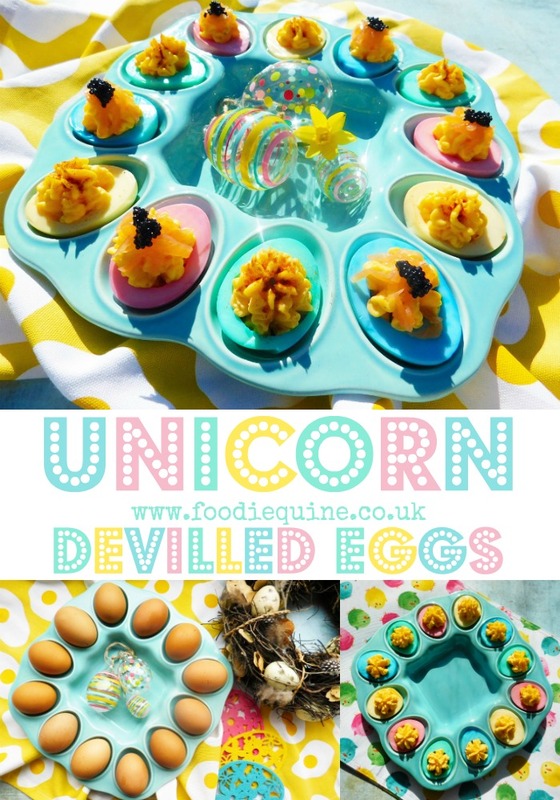 These would be the perfect hors d'oeuvre or amuse-bouche for any stylish party but of particular relevance for an Easter gathering - or a Unicorn Party! The addition of smoked salmon and caviar really does take these to a whole new level of sophistication and the saltiness of the fish goes so well with the creamy egg mayo. Drain and cool the eggs under cold running water before peeling. Bear in mind that fresh eggs are harder to peel than older ones. Cut each egg in half lengthwise, carefully remove the yolks and place them in a bowl. Rinse the egg whites to remove any remaining yolk. Mash the yolks until smooth and creamy with a generous quantity of mayonnaise. Season to taste with salt and pepper and set aside. At this point you could also add any additional seasoning such as mustard powder, garlic salt, cayenne pepper, celery salt or curry powder. Fill small bowls with water and food colouring in as many colours as you want your eggs. Gel colouring will give a better result and you will only need a tiny amount. Experiment with quantities of colouring and how long you leave the eggs immersed to get the colour results you desire. Check after a couple of minutes - mine needed between 3 and 5 minutes. Once you are happy with the colour remove the egg halves with a slotted spoon and drain on kitchen paper. Fit a piping bag with a star shaped nozzle and fill the whites with the with the egg mayonnaise yolk mixture. If you don't have an egg serving plate (mine came from TK Maxx) you can slice a wee bit off the base of each egg so they sit nicely or nestle them in shredded iceberg lettuce. 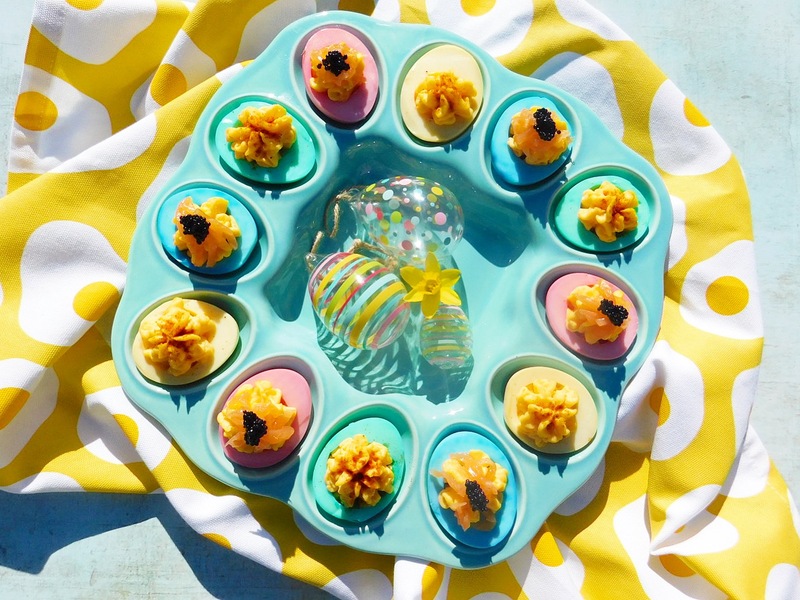 Top the Unicorn Devilled Eggs with finely shredded smoked salmon, caviar and a sprinkle of smoked paprika. Disclosure: This is a commissioned post for Juliettes Interiors. As always, all views expressed are my own. Thank you for supporting the brands who make it possible for me as a passionate Scottish Food Blogger to continue to share my Edible Food and Travel Adventures with you. I’m super choosy who I work with and promise to bring you only the cream of the crop. Oh what a fab idea! Love the look of these and they would really appeal to my children too! 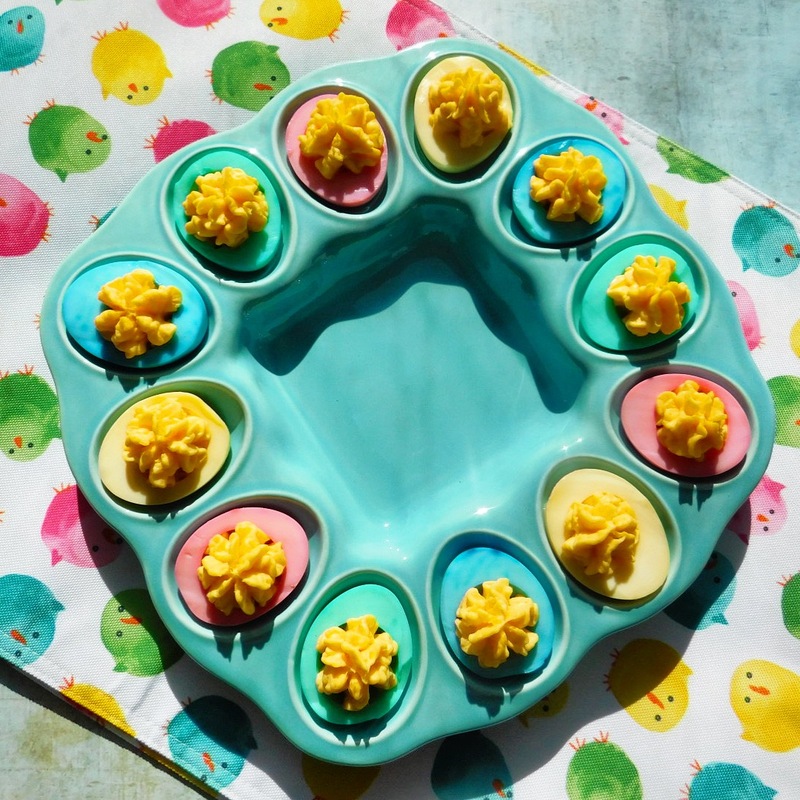 I think deviled eggs are essential for any gathering! I have never made them different colours though! !